After systematically ripping off Snapchat in Instagram, Messenger and Whatsapp, Facebook has now integrated the same Stories functionality into its core app, which gets more than 1.7 billion mobile visitors a month. The new feature is prominently positioned at the top, with a shortcut for Direct sharing to the far left, a second bubble next to it for your Story and the rest for updates from your friends. Facebook Stories lets people post a string of videos and photos that disappear after 24 hours. The feature works almost identical to that of Instagram's version, you can move back and forth through updates by tapping left or right, leave direct replies on people's Stories, and you'll be able to see who has viewed your Stories as well as the number of times each of them has been viewed. Thanks to a brand new in-app camera powered by technology Facebook acquired from MSQRD, you can add filters or masks -- what Snapchat calls "lenses" -- to your pictures or videos in real time. It’s easier to jump straight to the camera too — whereas you previously needed to navigate to the photos tab first, now a camera icon is located to the left of the search field or you can just swipe right from the home screen. The company worked with artists Hattie Stewart and Douglas Coupland to design original filters for the app. There are over 70 filters which will show up depending on your region, simply swipe up or down to scroll through them, and you'll see the filter take effect on the main screen. 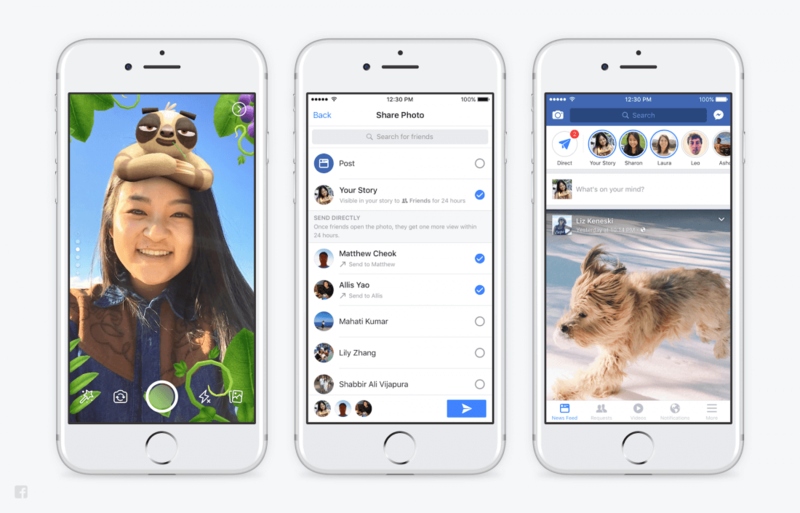 "Stories has become the format for people to create photos and videos and share them with one another immersively across social apps," Connor Hayes, a Facebook product manager told Engadget. "This is something that Snapchat's really pioneered. Our take is that Stories has become a format for people to share and consume photos and videos across all social apps." The update is rolling out globally starting today on iOS and Android.